Many executives now see business intelligence as a key buzzword. But what does this mean for the future of business intelligence? With business intelligence tools front and center in today’s marketplace, what will we see happen to this sort of popular business methodology as we move forward? To answer these questions, we’ve made some predictions about the future of BI. The software is expected to become more collaborative, more proactive, more insightful and more equipped to handle Big Data. 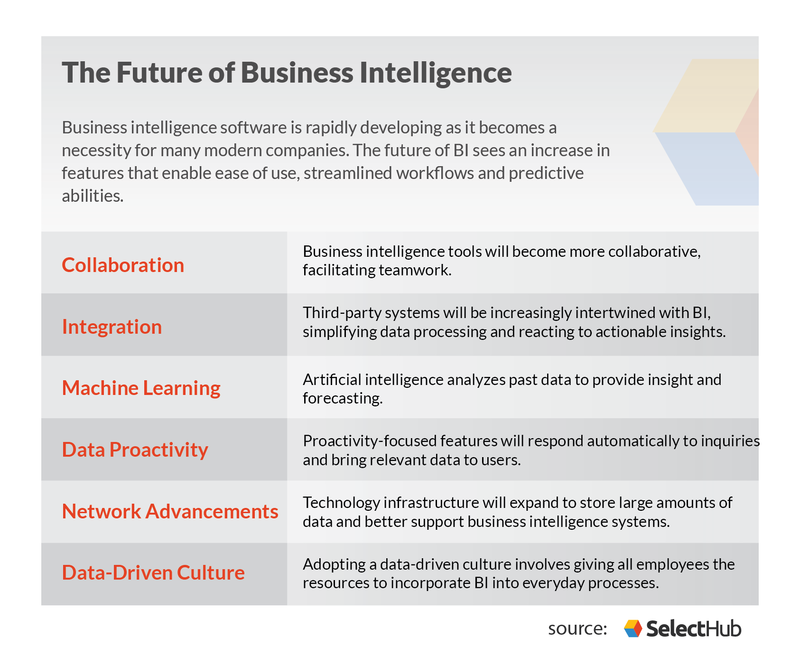 Collaboration, automation and data-driven business are the top focuses for business intelligence software advancements in 2019.
Business intelligence software will become more integrated with other essential platforms. One of the key business intelligence future trends many experts are predicting is a growth of the digital business intelligence world into a space where tools and platforms will become more broad-spectrum and eventually, more collaborative. Many of today’s tools are siloed and independently operated by users — unconnected to a broader network. However, there is a consensus that the next generation of business intelligence will be geared toward larger sets of users and more connected to greater systems. This type of trend is now evident, with the expansion of some BI platforms toward more evolved collaborative and machine learning systems. Business intelligence software is expected to become more embedded in well-established workflows. Many vendors are working toward this increased integration already, with application programming interfaces (API) allowing for data analysis within users’ existing systems. Integration abilities are expected to expand in BI software from the inside out, simultaneously offering third-party functionality from within a business intelligence tool while also implementing BI capabilities in other applications. A data analyst may observe “The marketing spend for a certain advertising company is very high to acquire a new customer, and so you may want to decrease the budget on that marketing company, or you may want to stop the ad altogether.” This is an example of possible actionable insights from data, provided by my interview with Lucas Thelosen, VP of professional services at Looker. “So why not just take the action right there?” With advanced integrations, users will be able to access the necessary systems to make such changes. The functions of third-party systems will be built-in to your business intelligence tool, offering a full-service platform. You can react to data without ever leaving your business intelligence software. He continued with other potential scenarios, saying users are able to shut down idle servers, react to support tickets and update records in a CRM such as Salesforce, all from within a report and based on the presented data. With these third-party systems integrated into the BI software, users can take action on data insights without leaving the platform. Having all programs intertwined quickly pulls data from all sources and consolidates the information, streamlining workflows. In the same vein, business intelligence software users will be able to access data analysis without actually opening their business intelligence program. The system can send alerts and emails with updates on changes to data. Certain Slack commands will return the data points and insights you need. In a few years, this technology will evolve into AI-powered chatbots. Native language processing will provide direct answers to users’ BI inquiries. This concept of machine learning is another major trend expected to take off in the business intelligence software industry in the future. An example of a data visualization, from Domo. 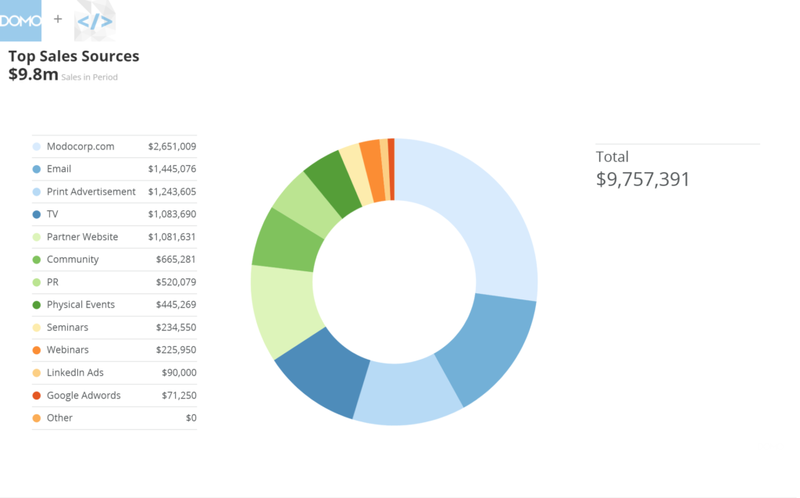 With the advanced integration abilities of future business intelligence, users will be able to increase the money spent on top sales sources from within a dashboard like this. BI software is expected to become increasingly intuitive in the coming years. The predictive capabilities of these systems are projected to expand into identification features that provide insight based on the context of the proposition. For example, a business intelligence tool will be able to answer a question differently based on factors expressed in the inquiry and tailor the answer to fit the needs of the user. With machine learning-enabled BI, typical restrictions to “what-ifs” are lifted. Artificial intelligence can analyze trends and past patterns to make educated guesses about your data inquiries. Eventually, you get to a place where business intelligence work doesn’t have to be jump-started by human users anymore. Instead, you’re more likely to passively receive this intelligence than you are to go looking for it in a report or even on a dashboard. This is data proactivity: information brought to you. This may be as simple as important data points being more prominent in a visualization or as advanced as notifications providing direct answers. Up to this point, companies have been widely trumpeting innovation in their visual dashboard designs. Features like more sophisticated charting and graphing have become paramount, and data visualization has become the watchword. A 2011 Quora post by Jason Kolb shows emphasis on this trend has been building for a while. “Relevant data will find you, and not vice versa,” Kolb wrote. Kolb references trends like real-time deep analysis and more personalized data several years prior to the current marketplace. We’re already seeing some of these AI types of advances deliver rich data to consumers and business users. Now, as we approach 2019, “40 percent of digital transformation initiatives will be supported by cognitive/AI capabilities, providing timely critical insights for new operating and monetization models,” predicts the International Data Corporation. The concept of data proactivity is directly related to third-party program integrations and AI. To put it simply, all of these features offer the benefit of providing answers based on your business’ stored data. Whether you directly engage the system or not, an intuitive tool will bring the answers to you. 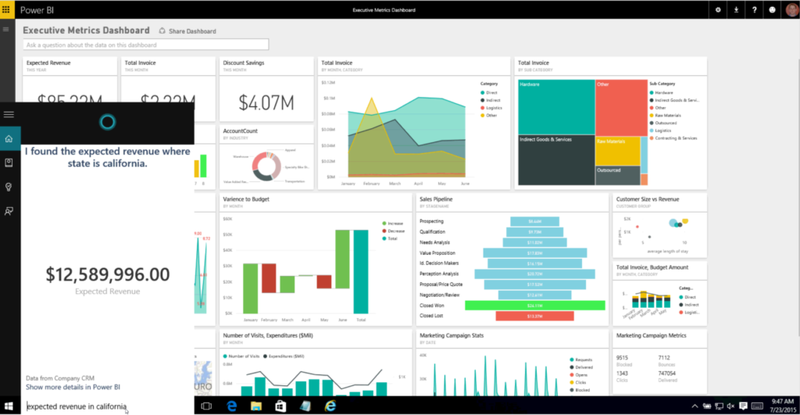 Data proactivity features will bring data to users, similar to how Cortana answers questions in Power BI. In a few years, this functionality will reach beyond BI platforms. Similar notifications will be available in third-party applications, without the need to seek data or even impose a question directly. At the same time, as software technologies are doing more with BI data, new networking structures are emerging to handle these massive troves of data along with their flow into and out of business systems. We’ve seen the cloud take over large swathes of the business world, where third-party companies offer services to individual clients to help them manage business intelligence and analytical data. But behind that vendor wall, you have advances like network virtualization. Here, engineers are figuring out new ways to deploy hardware architectures and automatically scale with the volume of data. New technologies like container architectures are also helping this process along. Solid network architecture is a necessity for any software — it’s the backbone of the system. Business intelligence tools are no exception, as in addition to normal infrastructure needs, robust data storage is also essential. This provides the base of your business intelligence solution and can be a differentiator in the way your organization uses the system. As stated in an article from Analytics Training, “To start with the effort of building business intelligence systems, one needs a framework comprising of best practices, policies and standards. Business intelligence architecture, by providing this framework, ensures that the development efforts of multiple projects fit neatly together as a cohesive whole to achieve the desired BI system.” In short, network advancements will help build the tool you want and store the data you need. One major player in the data revolution is Apache. With a range of Hadoop and related open-source tools, the Apache foundation has played a critical role. However, paid services like Amazon Web Services are also major participants in the rush to provide architectural support for new business intelligence methods. How Can Your Business Become More Data-Driven in the Future? The business intelligence industry has expanded exponentially in recent years and is expected to continue growing. If you want to make the most of data analysis in an established or newly adopted BI system, your team should be data-driven. According to Thelosen, having clearly defined goals and committing to a data culture are essential. Businesses should focus on why and how they are using data. With these objectives in mind, leaders can form a plan for BI use and include their team, establishing a data culture. Thelosen outlined three components of a data culture: a top-down commitment to analytics, a bottom-up commitment to analytics and education. The top-down and bottom-up commitments to data culture essentially revolve around involving the whole team in business intelligence. Upper management should include dashboards in presentations and company-wide message distribution, while lower-level departments should make a point to use data in everyday processes. Thelosen recommends having a “data champion” on each team, so every department is focused on incorporating business intelligence into workflows. BI software will become more user-friendly as the industry grows. This growth will also drive a more knowledgeable user base. But along with these improvements, business leaders need to take on the responsibility of educating their workforce. “We can’t just expect everybody to be data-driven. It’s like we can’t just expect everybody to fly a helicopter. We need to provide education on how to do it,” said Thelosen. Beyond technical training, it is necessary to inform employees of tangible business objectives for data and how the software can achieve those objectives. Thelosen also emphasized the importance of having a solid technical infrastructure, utilizing effective ETL capabilities and owning your data. As much as the business intelligence industry grows and changes, a sturdy base will always be on-trend. All of this describes some of the modern advances in BI as we continue to progress through the era of Big Data. The future of business intelligence is likely to be much more automated and aggressively utilized, with fewer bottlenecks in terms of interface limitations and the free flow of data. Future BI trends are all part of a quickly evolving model that is essential to the progression of modern businesses. What is the future of business intelligence in your opinion? Are there features or functionality you would like to see become a standard for BI software? Leave us a comment! 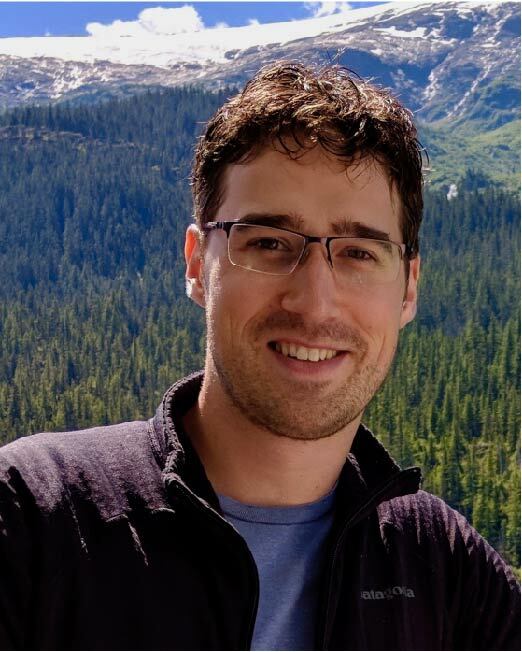 Lucas Thelosen leads Looker’s Professional Services team focused on educating and supporting customers. Prior to Looker, Lucas founded DAS42, an analytics consulting firm working for companies such as Uber, Snapchat and Cigna with offices in San Francisco, Colorado and New York City. He has led analytics teams at various start-ups prior to starting his own firm. Lucas lives in Colorado with a passion for skiing, mountain biking, woodworking and spending time with his wife and three daughters. See the Price/User for the top Business Analytics Software... plus the most important considerations and questions to ask. Discover the best BI vendors for you. Pricing, Ratings, and Reviews for each Vendor. PLUS... Access to our online selection platform for free. Jump-start your selection project with a free, pre-built, customizable BI requirements template.